Good bugs and bad bugs are the topic of a workshop Thursday, July 24 that will include a field trip to the Riverfront Park Xeriscape Garden. 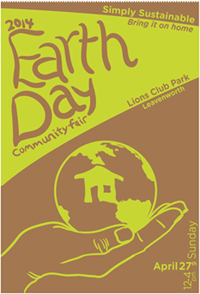 The workshop is from 9 a.m. to 3 p.m. at the North Central Regional Library, 16 N. Columbia St., Wenatchee. The program will focus on integrated landscape and garden management practices that support pollinators and other beneficial insects. Most gardens contain far more good bugs, or beneficial insects, than pest insects, said coordinator Paula Dinius. Beneficial insects and other organisms that kill pests are called natural enemies. In any pest management program, it is important to encourage these natural enemies by avoiding pesticides that kill them, she said. Gardeners can also encourage beneficial insects by choosing plants that provide them with pollen, nectar, and shelter and by keeping ants out of pest-infested plants. Learn to identify good bugs, both in their adult forms and immature (larval) stages. If pesticides are needed, learn to use non-chemical alternatives or less toxic pesticide products whenever possible. The registration fee is $10. Register by mailing this form to Paula Dinius, Urban Horticulturist, WSU Chelan County Extension, 400 Washington St., Wenatchee, WA 98801. The workshop is sponsored by WSU Chelan County Cooperative Extension and Chelan County PUD. Consultant Ellen Lamiman, owner of Energy Solutions in Winthrop, helped a group of Leavenworth women meet their goal of building a community solar farm on the roof of Icicle River Middle School. When three Leavenworth women decided their city should have the first community solar system in Chelan County, they turned to the woman who had helped build the first community solar system in Washington state. 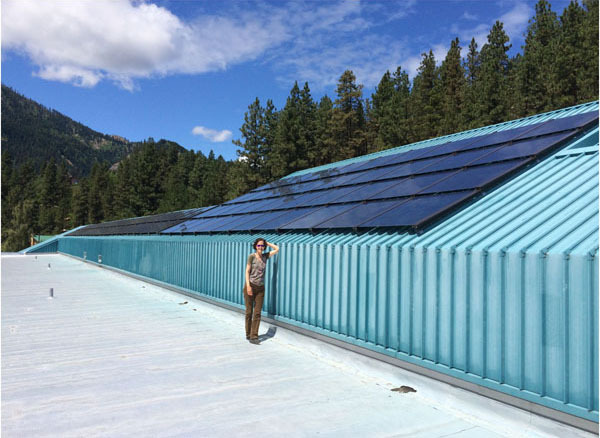 Consultant Ellen Lamiman of Winthrop put the Leavenworth project on a fast track and within five months, a 19-kilowatt system was up and running – way up, that is, on the roof of Icicle River Middle School. It was connected to Chelan County PUD’s electrical grid on June 27. In 2010, Lamiman brought a 20-kilowatt system to the Okanogan County Electric Cooperative in Winthrop – the first community system to take advantage of generous incentives under the Washington Renewable Energy Cost Recovery Program. In 2006, she had served as a consultant for construction of the state’s first community solar farm in Ellensburg, a project that helped smooth the way for development and passage of the current state incentive program. Lamiman said she had been contacted several times by various Leavenworth residents about setting up solar in town. But it wasn’t until members of Faith Lutheran Church called her that a project gelled this year. Members of the church’s Earth Stewardship Group, reading a book on climate change by Frances Moore Lappé, were motivated to help reduce the city’s carbon footprint. They called Lamiman. Anyone who’s met Lamiman knows she’s a force to be reckoned with, too. When you’re a pioneer with a passion for what you’re doing – and Lamiman’s experience with solar stretches back 19 years – you’ve got to be. 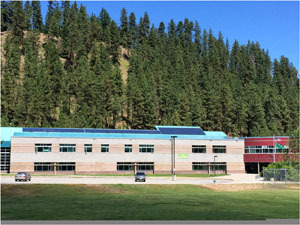 The solar system at Icicle River Middle School was connected to Chelan PUD’s electrical grid on June 27. Investors will be paid through a state incentive program and the school will receive funds through the PUD’s SNAP program. You need to navigate the complicated state program and its associated pitfalls, including securities rules designed for bigger corporations, not small local projects. To ease the regulatory way for the Leavenworth endeavor, Lamiman struck upon the idea of using the church’s nonprofit status to apply for an exemption. The catch: Shares in the community solar project could only be advertised or sold to people who had had some involvement or relationship with the church or middle school. Not a problem, said Lamiman, who learned long ago that “in all cases it really boils down to trust. Everyone thinks solar is a great idea but no one’s going to put up money if they don’t have that trust” in the people planning each project. Prior to that she had coordinated Bonneville Power Administration’s conservation program for co-op members. She runs her business, Energy Solutions, from her home. She hasn’t had any trouble finding takers for solar in her area, where power costs are more than double Chelan County PUD’s residential rate of 2.7 cents per kilowatt hour. Thirty-one co-op members signed on to the 2010 project within two weeks. So many people had wanted to invest, in fact, that a second project was built near Winthrop’s sewage treatment plant. That 23-kilowatt project, with 49 investors, began producing power in 2011. And in 2012, a 35-kilowatt system was installed in Twisp in Okanogan County PUD’s territory with 38 investors. There won’t be any more community solar under the current state program though, Lamiman said, unless the Legislature modifies and extends it. Set to expire in 2020, that leaves only six years for investors to recover their costs and make a profit. The state program pays $1.08 per kilowatt hour, which is why Lamiman pushed hard to make a self-imposed deadline of July 1 for the Leavenworth system to be generating electricity. You’ve got to make hay – or kilowatts, that is – while the sun shines. It’s only been in the last couple of years that solar has really taken off in the state, Lamiman noted. It’s been mostly smaller companies doing local work, but there’s a concern that that may change, with big corporations coming into Washington State and leasing solar systems to homeowners. While an increase in solar generation is beneficial, the change could hurt local installers and manufacturers, she said. She expects the Legislature to debate how to protect homeowners and businesses, and to discuss changes to the Renewable Energy Cost Recovery Program, in 2015. Driving to the Oregon Coast recently, my husband and I traveled through or near three of Washington’s wind farms. I have to agree with his assessment that those massive metal towers are just a little bit scary. A science fiction buff, he’s reminded of the mammoth, four-legged war machines that stalked Luke and Leia in one of the early Star Wars films. Those tall white towers seem alien to me, too: Am I on Highway 97 or another planet? Wind towers loom over the rolling farm landscape near Goldendale, Wash. According to the American Wind Energy Association, Washington ranks eighth in the nation for number of utility-scale wind turbines (1,609) and installed wind capacity (2,808 megawatts). There are 26 wind projects in the state. The Kittitas Valley Wind Farm, located along Highway 97 northwest of Ellensburg. Forty-eight turbines extend over the valley near the Blewett Pass/Ellensburg intersection. They’re situated on 6,000 acres of the Anderson Mountain range. The project is owned by Horizon Wind/EDP Renewables. Puget Sound Energy’s Wild Horse wind farm is located 16 miles east of Ellensburg. Wild Horse has 149 turbines on 10,000 acres. 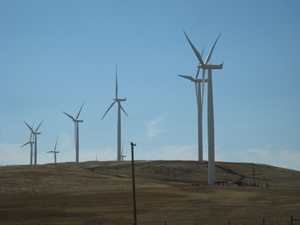 These are the turbines you see when you attend a concert at The Gorge Amphitheater or drive to or from Moses Lake. PSE operates an informative visitor center and conducts tours. The site includes a huge solar farm. Power is used by PSE customers. Windy Point/Windy Flats, near Goldendale, is a 90-square-mile wind farm covering 30 miles along the Columbia River ridgeline near the Oregon border. It’s operated by the Cannon Power Group based in San Diego. The power is sold into California. Q. Why are the rotor blades going so slow? Can they still produce power? Do they ever reach speeds like a plane’s propellor? A. While the turbines have different manufacturers and can be expected to behave somewhat differently, PSE says the turbines at Wild Horse can produce electricity at wind speeds as low as 9 mph. The Wild Horse turbines reach their peak production at 31 mph and shut down at constant wind speeds above 56 mph. Q. Are they as big as they seem? Q. Can you look inside them? A. The visitors in hardhats shown in the Wild Horse video did. Q. Why don’t we have big wind projects in Chelan County? A. There isn’t enough wind. And we have plenty of clean, renewable hydropower. But Chelan County PUD does own a small share of Phase 1 of the Nine Canyon Wind Project near Kennewick. Wind projects come with environmental drawbacks as well as benefits. They create jobs during construction but only a handful for the long-term. And in the spring there can be too much of a good thing — too much water and wind create renewable power gridlock that requires one or the other to cut back or shut down. How Stuff Works: Do wind turbines kill birds?